Say you have a shop, and you use WooCommerce and WooCommerce Bookings. Most of the time you want to have your Bookings available for people to buy, always! However, some Bookings are more seasonal, or one-off Bookings. For example you might have a tour you offer for 1 month but only every few years. Or a seasonal booking like a sleigh ride. In those cases, you might not want to leave that Bookable Product just sitting in your store without anyone being able to buy it. Sure, you can go in and manually set them to draft, or private, but what if you have a LOT of them or don’t have the time to do that? 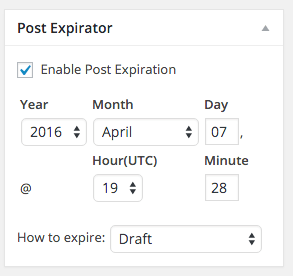 Here’s where Post Expirator can help!